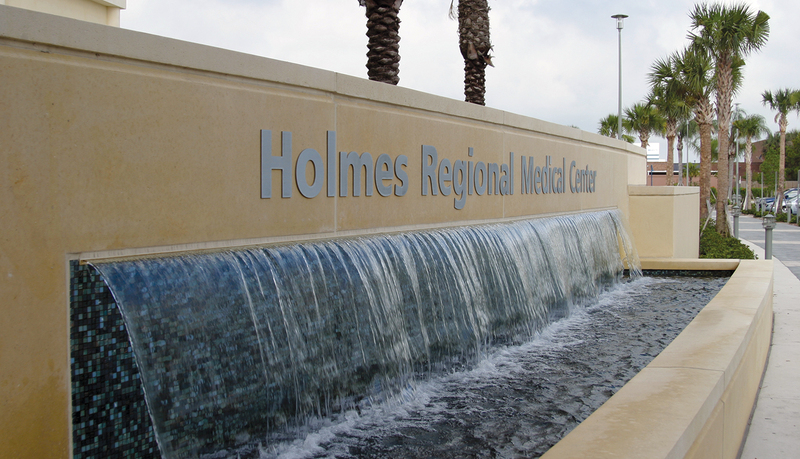 Holmes Regional Medical Center (HRMC), located in Melbourne, Fla., is a full-service, not-for-profit, 514-bed hospital. 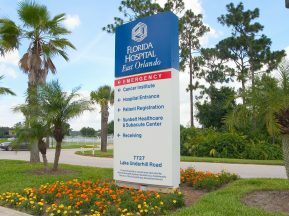 HRMC is affiliated with the Health First network of hospitals serving Florida’s “space coast” along the Atlantic Ocean. 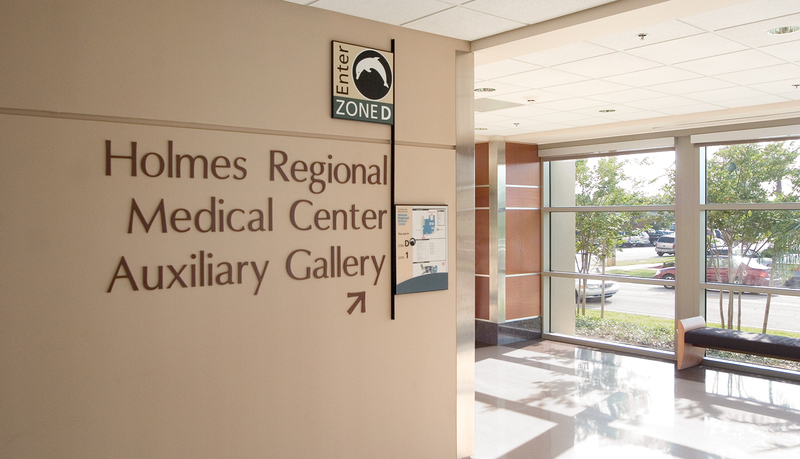 With more than 500 physicians on staff, HRMC offers a full range of services. 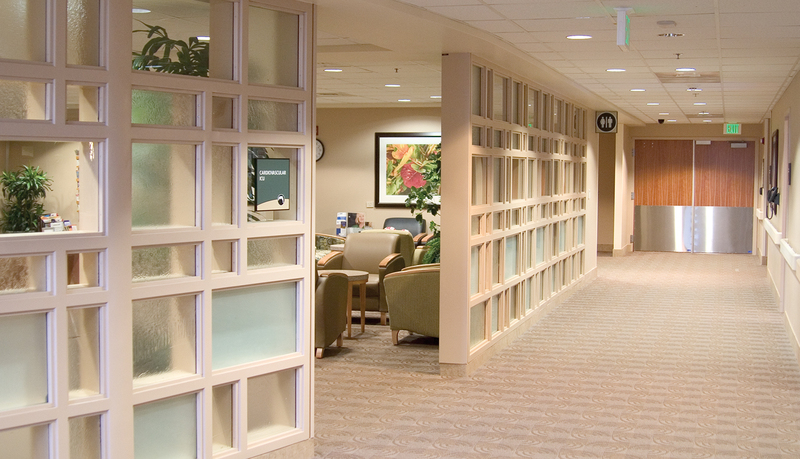 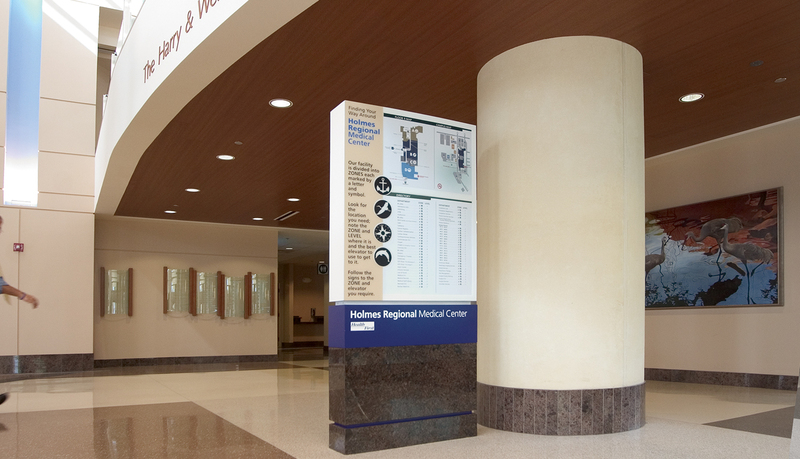 HRMC needed a trusted, reliable solutions partner to manage and implement a phased installation of a new numbering and wayfinding system during the renovation of the campus. 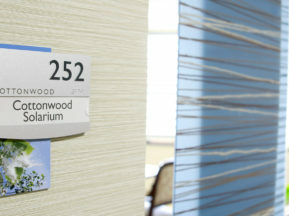 HRMC mandated that caregiving not be interrupted – therefore, the installation would have to proceed during working hospital hours and all facilities and services had to continue throughout the renovation process. 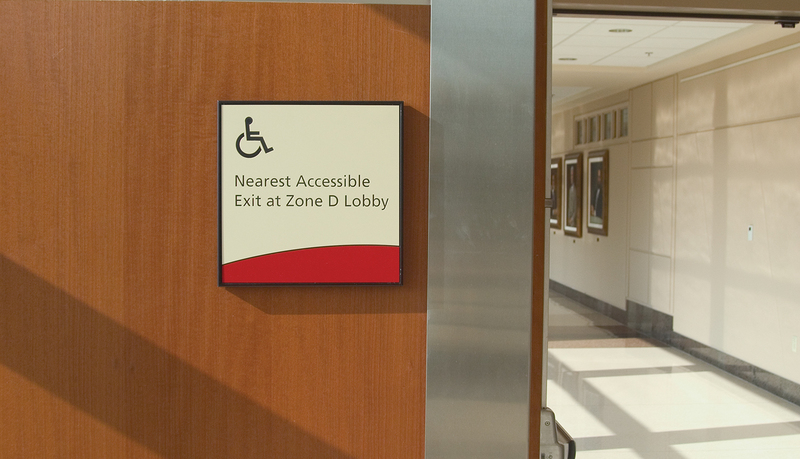 The new numbering and wayfinding plan meant that each building in the master-planned campus would have to undergo changes and installation in stepped phases. 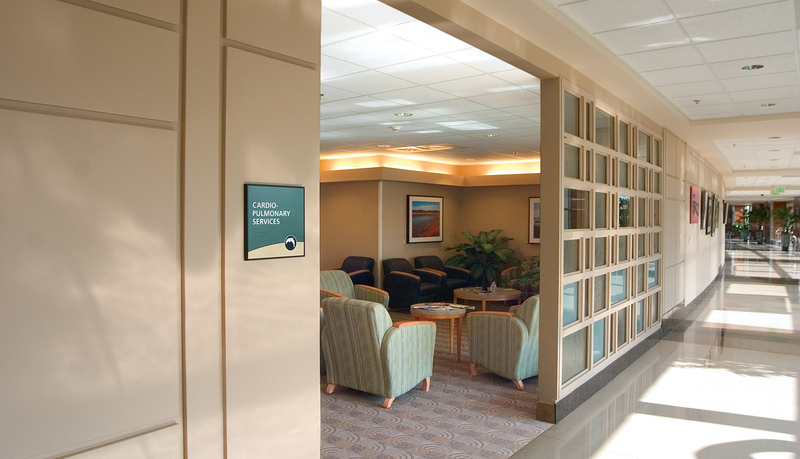 ASI’s team of trusted and experienced project managers and consultants partnered with Holmes Regional’s architect and designer, HKS, and the Holmes Regional facility management team to create an implementation plan that spanned 18-months. 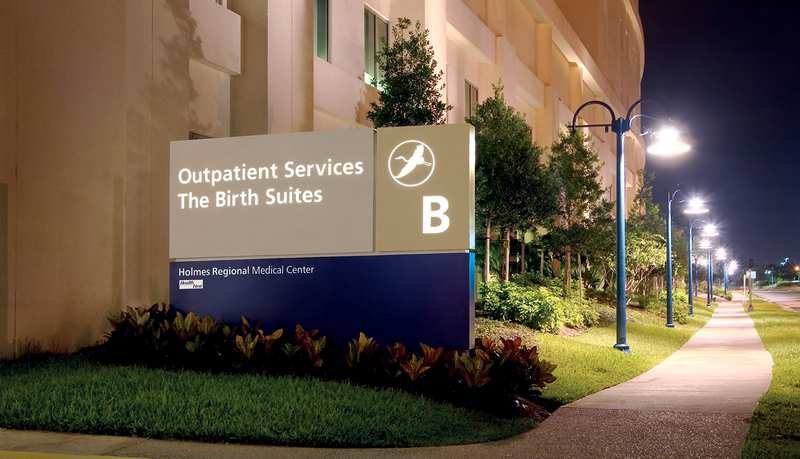 Using the new signage designs created by HKS, ASI strategically planned the fabrication of temporary signage as well as the final interior and exterior signage for Holmes Regional. 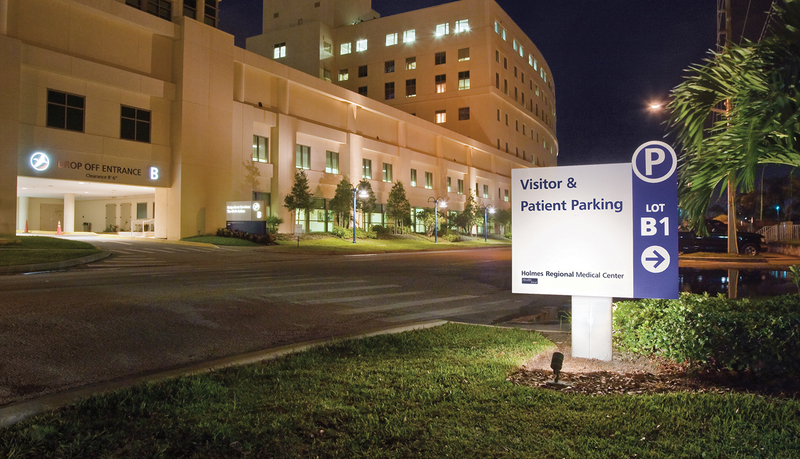 The exterior signage includes large, curved-face internally illuminated exterior monuments as well as parking, directional and building identification signage. 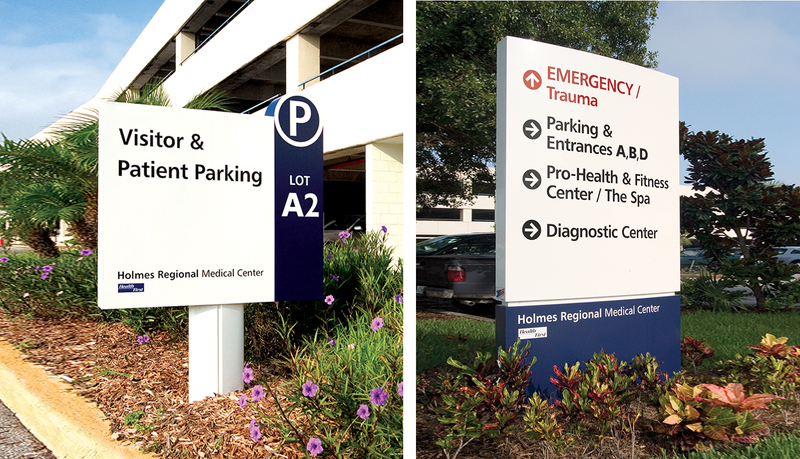 All of the exterior signage meets or exceeds Florida’s 125 mph wind load requirements. 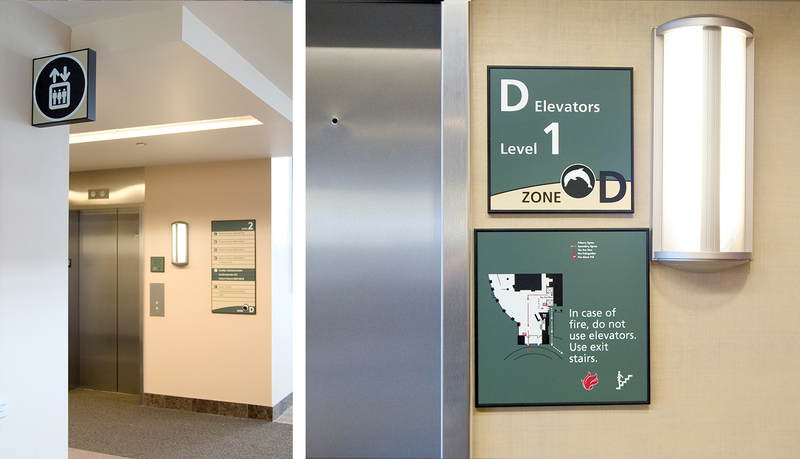 ASI also fabricated cut metal dimensional letters, interior illuminated building identification logos, and all of the custom ADA-Ready™ interior signage for Holmes Regional. 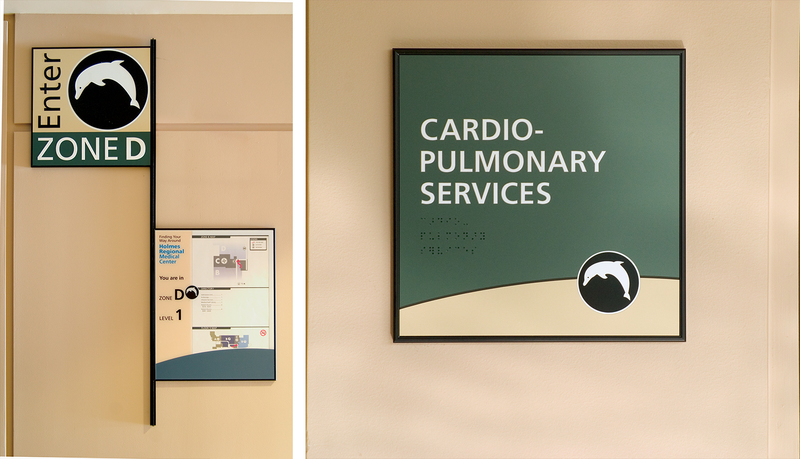 The installation process included removing the old signage, cleaning and repairing the walls, and reinstalling the new signage – all during operating hours and with no downtime for any department. 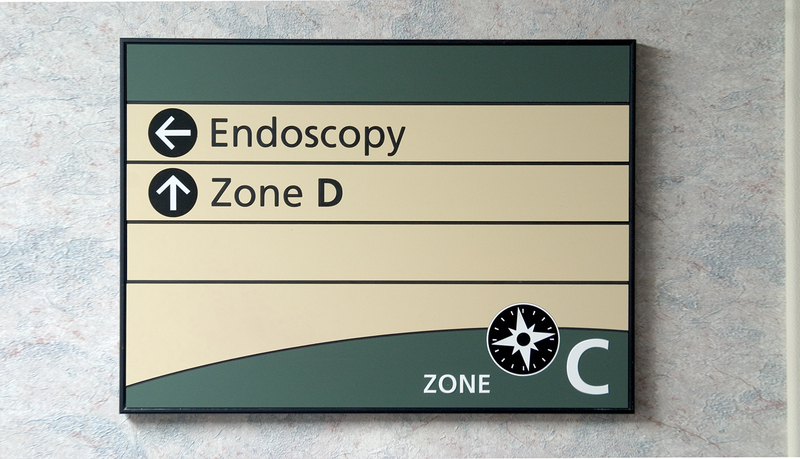 There are four zones throughout the master planned campus – zones A, B, C, and D – that required careful planning to ensure patient care was never interrupted. 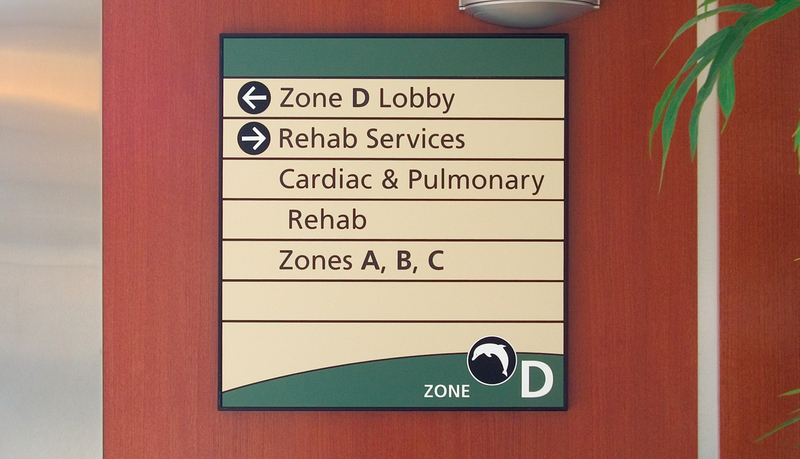 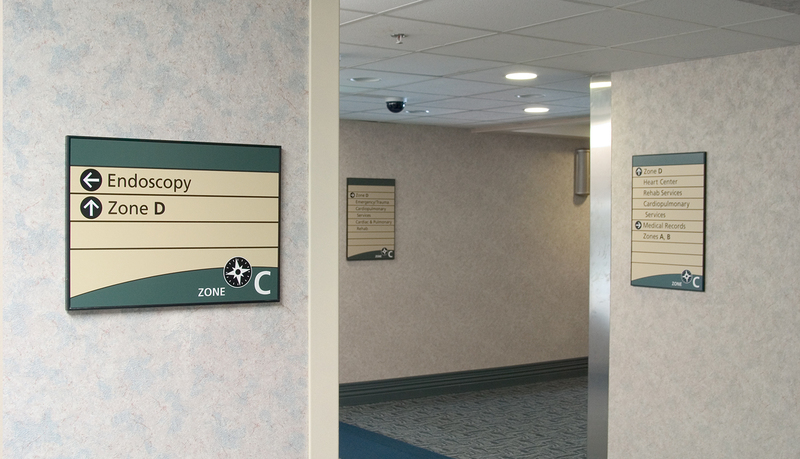 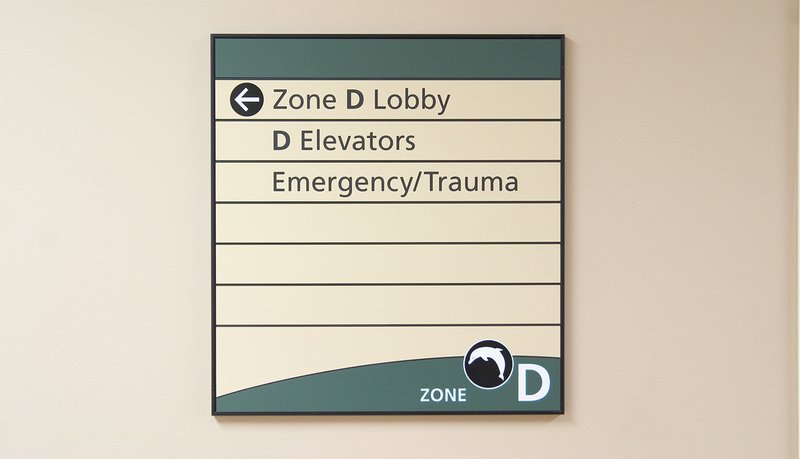 The new signage is the key component to communicating the new numbering and wayfinding system to patients and staff, so there was no room for error or delay. 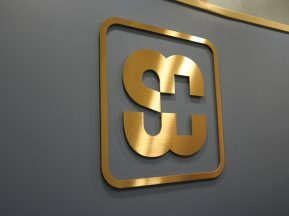 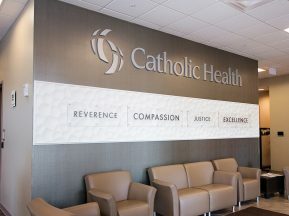 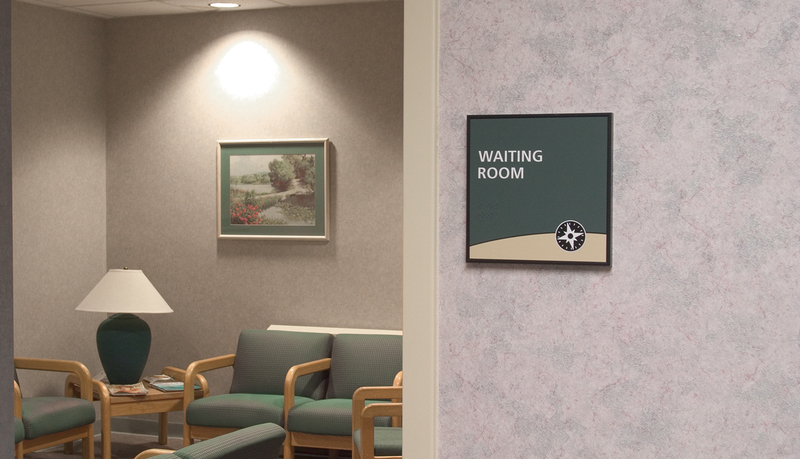 The first phased installation included 2,400 signs and was completed within three months, which met the client’s “go live” date on time and on budget.